Just Vegas, Baby? : What Are the Odds that the Oakland Raiders Move to Sin City? Our writer chats with insiders and experts to make sense of the Silver and Black's flirtation with Las Vegas. On Sunday, the Raiders kick off their season on the road against the New Orleans Saints. After more than a decade of losing, fans hope young quarterback Derek Carr and a slew of new talent will return the Silver and Black to relevance again. There's even talk of actually making the playoffs for the first time in thirteen years. At the same time, these next few months could also determine if the Raiders remain in Oakland or bail. It's been no secret that the team is displeased with lagging efforts to replace its fifty-year-old Coliseum home. In recent years, owner Mark Davis and Co. have looked at relocating to everywhere from San Antonio to Southern California — and now Las Vegas, where negotiations soon could be heating up. This Thursday, in fact, the Southern Nevada Tourism Infrastructure Committee will meet again, the latest gathering of a nearly two-year courtship between Sin City representatives and Raiders brass. The team and casino mogul Sheldon Adelson's vision is to build a $1.9 billion domed stadium near the Las Vegas strip. But this plan hinges on a lavish $750 million gift from taxpayers, and approval by wary NFL owners. In the weeks to come, Nevada Gov. Brian Sandoval might call a special legislative session to discuss this plan and the record public subsidy. Meanwhile, East Bay fans — who bought up all the team's 51,000 season tickets this year — and local officials haven't given up hope. Former Raider Ronnie Lott has reportedly organized a coalition that wants to purchase a stake in the franchise and make a financial investment in building a new stadium at the Coliseum site. In fact, Lott's group signed a 90-day memorandum of understanding with the city and county last week as part of this process. The Express interviewed numerous sources with inside knowledge of the Raiders' situation during the past month. Many insist that the team's Sin City effort is serious, not just a flirtation or ploy to get a better stadium deal in Oakland. Yet these same insiders were adamant that the Vegas drama doesn't mean the team's leaving the Bay, either. It's as if representatives for Las Vegas, Oakland, and other cities are at a poker table, and all chips are in play, what with this contest reasonably likely to be decided by early 2017. So, who has the best hand? Las Vegas' courtship of the Raiders goes back to at least November 9, 2014, when the Silver and Black fell 41-17 to the visiting Denver Broncos. Former running back Napoleon McCallum was in Oakland that day to light a ceremonial torch for late Raiders owner Al Davis. McCallum played nine seasons for the team before suffering a career-ending injury in 1994. He moved to the Las Vegas area in '96, and since 2005 has served as director of community development for the Venetian Resort Hotel Casino, owned by Adelson's Sands Corporation. 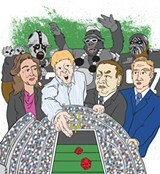 McCallum spotted Raiders owner Mark Davis that day, someone he'd seen around the locker room during his playing career. "I knew about all the problems going on with the stadium," McCallum told the Express. "I said, 'What you really ought to do, you ought to come out to Las Vegas.'" Pro sports in Vegas is a time-old dream. When the Maloof Family owned the Sacramento Kings and The Palms hotel and casino, for instance, there was talk of the NBA franchise relocating to Sin City. But until this past June's announcement of an NHL expansion team, no team in any of the four major sports has operated in town, having shied away over fears about gambling. But those concerns may be subsiding with the rise of Internet gaming and websites such as FanDuel and DraftKings. Las Vegas carries some unique benefits, as McCallum pointed out: 150,000 hotel rooms in less than a two-mile area, plus 42 million tourists annually. "If you count the visitors that come here, we're about second-largest football market," he argued. Vegas also has some history of sports arena and stadium success. Danny Tarkanian, a Nevada Congressional candidate, spoke of how his late father, legendary college basketball coach Jerry Tarkanian, campaigned to get the Thomas & Mack Center built. "That was one of the nicest stadiums on the entire West Coast, it was a great recruiting tool, it brought the UNLV basketball program to a whole another level, and it was paid for with public funds," Tarkanian told the Express. But nothing evolved for the Raiders and Sin City until a press conference in Las Vegas on April 28 of this year, when Davis declared that he wanted to turn Nevada, the Silver State, into the "Silver and Black State." 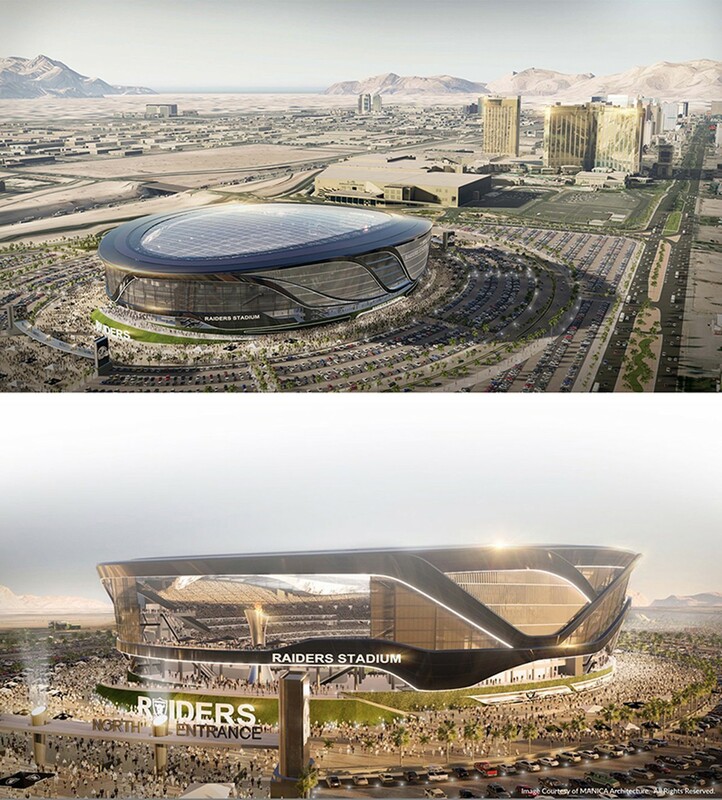 And last month, on August 25, the SNTIC released preliminary renderings of a new Raiders stadium in Vegas. These images, and an accompanying thirty-page document, were little more than a marketing brochure for the proposed new Raiders home and its potential development partner, the Sands Corporation. (They know that they must garner support for the $750 million public subsidy, which would be raised through a hotel tax.) And Twitter and Facebook went wild over the images (see photos). 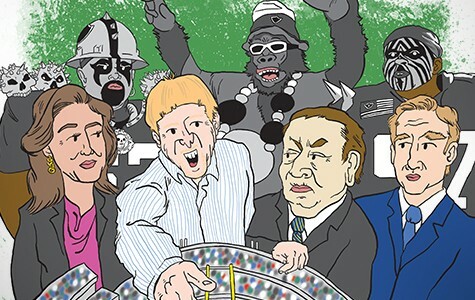 In fact, the hype machine had already been primed the day before, when a Forbes.com report revealed that the team secured a trademark for the name "Las Vegas Raiders." As for the Sands' and Raiders plan: According to the SNTIC document, the Raiders and the NFL would cover $500 million of the stadium's $1.9 billion price tag, with private investors coming up with $650 million and the public forking over the rest. The Bash Brother signs books at Barnes & Noble, but it's not like it used to be.